By (author) Richard Cooper, Esq. ; Jane Wood, Esq. 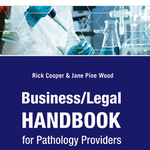 The handbook will be of high value to pathologists and pathology practice administrators from a variety of backgrounds, with or without a familiarity with law. And the accompanying e-book is updated quarterly with changes and new solutions to accommodate them.